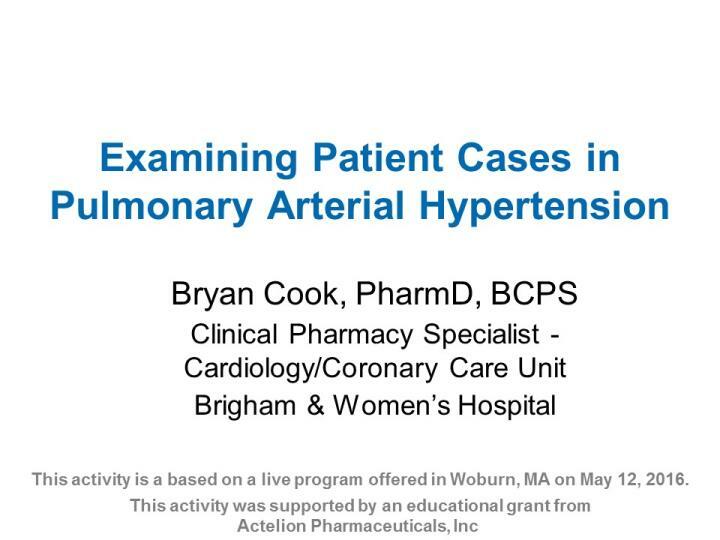 This activity is intended to educate pharmacists on therapeutic options for the treatment of pulmonary hypertension. Participants will have a thorough understanding of the epidemiology, clinical symptoms, pathophysiology, and treatment goals of pulmonary arterial hypertension. Diagnostic methods will be reviewed. The presentation will detail pharmacologic treatment options for PAH including targeted pathways, routes of administration, indication, dosing, benefits, and potential adverse effects. Patient cases will be presented throughout the session to enable participants to apply medical knowledge. This recorded activity is a based on a live program that was offered on May 12, 2016 in Woburn, MA. Brigham & Women's Hospital, Boston, MA does not have any relevant financial relationships with any commercial interests. American Health Resources assesses conflict of interest with its instructors, reviewers and other individuals who are in a position to control the content of CE activities. All relevant conflicts of interest that are identified are resolved by American Health Resources for fair balance and scientific objectivity. This educational activity may contain discussion of published and/or investigational uses of agents that are not indicated by the FDA. American Health Resources does not recommend the use of any agent outside of the labeled indications. The opinions expressed in the educational activity are those of the faculty and do not necessarily represent the views of American Health Resources. Please refer to the official prescribing information for each product for discussion of approved indications, contraindications, and warnings. Summarize the pathophysiology and classifications of pulmonary arterial hypertension. Evaluate therapeutic options in the treatment of PAH based on safety and efficacy. Apply guidelines to patient cases to determine best course of treatment.